Expectations for Cincy were perhaps muted for Kerber following a gruelling week in Rio where she took home the Silver medal in singles. However Kerber has fought exceptionally well to reach the final. The German player snapped the 13 match winning streak of Simona Halep on Saturday with a 6-3 6-4 semi-final victory. It certainly wasn’t a classic by any means but Kerber produced a significantly improved display from her quarter-final against Carla Suárez Navarro. On the resumption after a rain delay with Kerber leading 4-3 in the first set, she ran away with the next six games. Halep was committing a whole host of unforced errors as she produced a whopping 50 (! )in the entire match. Halep had recovered from a 0-4 first set deficit against Agnieszka Radwanska in the quarter-finals and was well on her way to repeating that feat, holding a break point to level up at 4-4 in the second set. Kerber though refocused and held on for the monumental win, booking her place in her second Cincy final and one match away from a quite remarkable achievement. Pliskova is enjoying her best week of the year as she sailed past Garbiñe Muguruza in a semi-final snooze-fest of a contest, 6-1 6-3. This is a great match-up for Pliskova as her serve often comes up trumps. She unsettled Muguruza with her depth on return, but also some tricky slices. Muguruza threatened a comeback as she went up a break in the second set but this lasted all of three minutes as Pliskova broke straight back, winning the last four games of the match. Head-to-head record: Kerber leads Pliskova, 4-2 in their head-to-head. Their last two encounters were in Premier finals in 2015 and both went the distance. 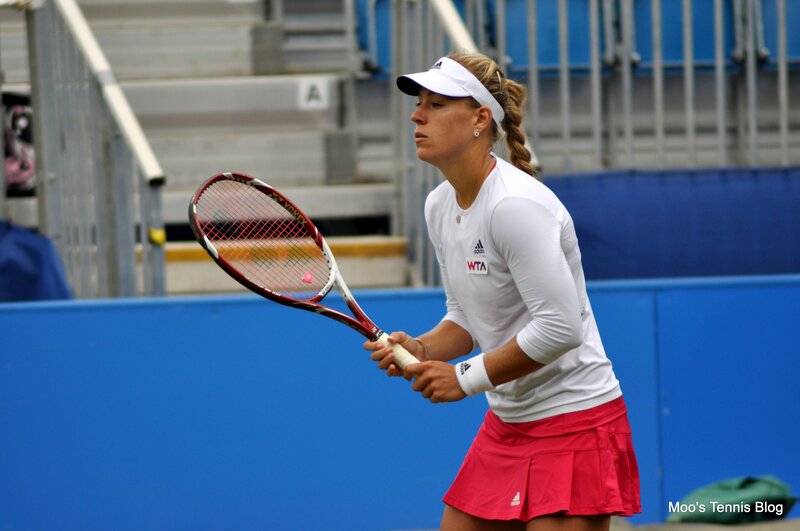 Kerber won in Birmingham (6-7(7) 6-3 7-6(4)) and Stanford (6-3 5-7 6-4). The pair will be playing for the first time in 2016. Interesting stat: Pliskova’s win over Muguruza was her best EVER win on the WTA tour. While she has beaten Halep in Fed Cup action, remarkably it was her first top five win on the WTA tour. Final thoughts: There is so much up for grabs in this Cincy final not just for Kerber but Pliskova too. I felt like this match-up was a mental stumbling block for Pliskova in 2015 and their finals in Birmingham and Stanford, while both very close, were a contributing factor to her poor performances after Stanford. With the prospect of playing Kerber again in a Premier final, this will be a key match for Pliskova to prove herself and potentially win the biggest title of her career. Most of the emphasis will be on Kerber though and I think she’s done so well just to reach this final having looked exhausted in her quarter-final match. It has been the mental aspect of her game that has improved leaps and bounds in 2016 and she is arguably enjoying her most consistent run of the entire year with her ability of gutting out wins and playing the big points well. I also love the injections of variety and her drop shot has been one of the most improved shots of the year… it rarely fails to find the mark. Pliskova is playing some terrific tennis right now and with so much on the line, it will be interesting to see how Kerber copes with the situation. It reminds me again of the round robin match in Singapore where Kerber needed a win over Lucie Safarova to qualify for the semi-finals but came up short. That match has acted somewhat of a stepping stone to the strides that Kerber has taken this year. This will be another step-up… nerves and fatigue could play their part but adrenaline might just kick in for Kerber as the world number one position comes into sight. August 21, 2016 in Cincinnati, Ka. Pliskova, Kerber, WTA. I really hope Angie can come through with the victory but it also depends on how Pliskova serves. She doesn’t have the best record going around against players with great defensive skills such as Aga, Angie or Halep. She sometimes gets too erratic on the big points. It’ll be an interesting final.. Hoping it goes the distance like their last few finals! Well obviously I’m rooting for Pliskova. This would be a real breakthrough win for her after making some real waves the past two years. I do feel like she should come into this with none of the pressure that she obviously had in their two final meetings last year where she was on the brink of top ten and a lot of people expected her to beat Kerber. A lot of her game has improved since then, most noticeably a plan B when her first serve % isn’t working. I also find it difficult to believe Kerber won’t be at least a little daunted by becoming #1. Or feeling the effects of playing so much tennis. It would nice to see Pliskova win though, after coming up short at a lot of Premier Events the last two years. She really needs a breakthrough though in a grand slam or winning an event like this to establish herself in a way. Let’s hope it’s as good as their last few matches! I have a preference for Plisko here but if Angie does win the final, and I think she’s more likely to because the prospect of a No 1 ranking will be a powerful incentive for her, I believe she’ll deserve both it and her No. 1 status. I don’t know what happened to Simona’s game in the semi though; 50 unforced errors in a match is very unlike her. I think the rain delay could’ve affected her game. Similar to how she was up against Stosur at the French Open this year before the rain delay, and it just kind of went downhill for her in that match. It’s strange to see Halep commit that many errors in 2 sets of tennis aswell! Good point about the rain and Simona’s game Aiden. Someone said on Twitter that heavy rain seems to be following the WTA tour around at the moment (starting at least from Roland Garros). Anyway, great win from Karo (Kaja?) today! Thrilled for Pliskova and Cilic wins, both really needed to take these titles to show they are a threat to the top players and not just the ones ranked beneath them. Even though I think Angie was obviously feeling the pressure, Pliskova played a near perfect match. Booming serves, deep returns right at Kerbers feet. Her slices are becoming pretty lethal and doubles has helped her net game immeasurably! I don’t think Angie was feeling the pressure that much…I felt like it was more physical? Like hitting a wall. Also, she said earlier this year (in a german interview) that she does not feel any pressure as Serena is a true champion and she would still feel like this even when reaching no 1 ranking. BTW: I want Serena to be healthy for the US Open as I’d love to see a “distance fight” between those two for the no. 1 ranking. Yeah, I’d like that too. I think if Kerber makes the finals then she takes #1 regardless of if Serena wins but the figures are very close and I’m not in a maths space of mind. It’d be awesome if they made the final and the ranking depended on the winner like Djokovic and Nadal in 2013.
someone said on twitter that if Kerber reaches the final, Serena needs the title to keep no. 1. That means the ranking would depend on the winner which would be awesome!!!! I saw the same although I can’t remember who it was! I’d agree, it seemed to me that Pliskova was too good and hitting the lines, and Kerber was a bit off physically rather than it being about the pressure… that was my take anyway! Yeah Angie was getting onto her groundstrokes a fraction late, which may have been tiredness catching up on her. But Pliskova was redirecting the ball incredibly well and without any seeming patterns. I’m glad that Kuznetsova pulled out of New Haven and is resting for New York. She’s due a slice of luck in a Slam draw.